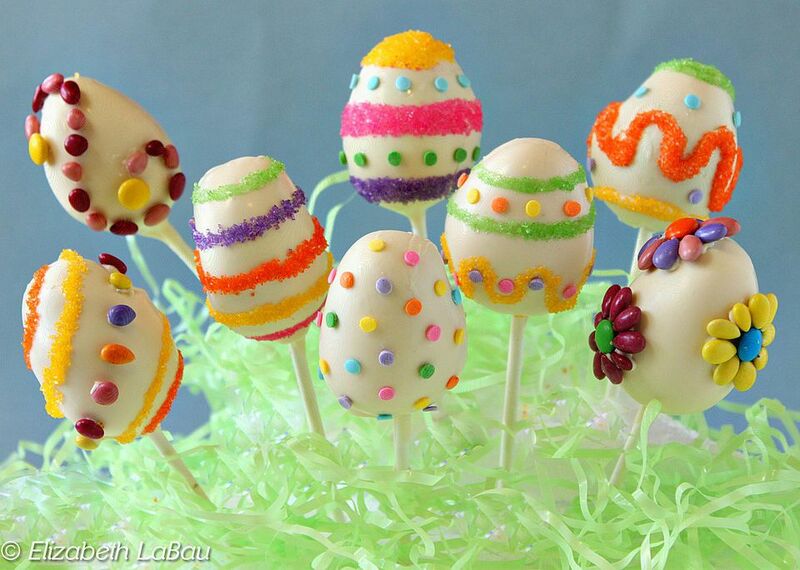 Make your Easter sweeter with these Easter Egg Cake Pops! Moist bites of cake and frosting are formed into egg shapes, made into lollipops, and decorated to look like festive Easter eggs. I like to keep a spring theme by using lemon cake and frosting, but you can use any flavor of cake and frosting you'd like. Be sure to check out the tutorial showing how to make Easter Egg Cake Pops! Place the cake in a large bowl, and crumble it roughly with your hands. Once it's in fine crumbs, add about 2/3 of the frosting and begin to mix it with your hands into the cake crumbs, working until the mixture is evenly moistened. You want the cake mixture to easily hold together when you press it into a ball, but still retain a little texture. My personal preference is to have some “crumb” left to the crumbs so that it is not just a gooey ball. Of course, tastes vary, so if it seems as if the cake mixture is too dry, or you like a gooier taste, add more frosting until you're happy with the taste and texture. Using a cookie scoop or teaspoon, form the mixture into small balls about 1-inch in diameter. Roll the balls into oblong shapes between your palms, and pinch one end until it's thinner so that they resemble egg shapes. Place them on the prepared baking sheet and freeze until firm, about 30 minutes. After the Easter egg pops have been frozen, remove them from the freezer. Melt the candy coating in the microwave and stir until completely smooth. Poke a skewer into the bottom of each "egg" to make a small hole. Dip the tip of a lollipop stick into the melted coating, then push the coating-covered tip into the hole in the egg. The coating will soon solidify and help hold the stick in place. Repeat until all of the eggs have been skewered. Holding a cake pop by the stick, dip the cake entirely in the candy coating until it is covered. Remove it from the coating and gently tap the stick against the side of the bowl to remove excess coating. Hold it until the coating sets (which will not take long with cold cake!) or stick the cake pop in a piece of Styrofoam to set. Repeat until all of the eggs are dipped. If they start to get too soft and move too much on their sticks, return them to the freezer very briefly until they firm up. Once all of the Easter egg cake pops have been dipped, it's time to decorate! Pour some of the remaining melted candy coating into a paper cone or a plastic bag with the tip cut off, and pipe on lines, dots, or squiggles for decorations. While the coating is still wet, cover it with sprinkles or candies to make colorful designs and patterns on your eggs. Alternately, you could apply light corn syrup with a paintbrush and use this to affix sprinkles and candies to your eggs instead. Let the coating or corn syrup dry completely, and your Easter egg cake pops are finished! Store the cake pops in an airtight container in the refrigerator for up to a week. For the best taste and texture, allow them to come to room temperature for about 20 minutes before serving. Still craving Easter candy? There are plenty of other homemade options.